New RNA and DNA Elution Kit™ for fast extraction nucleic acids form polyacrylamide gels. High quality, RNA and DNA fragments are critical for PCR/RT-PCR, sequencing reactions, Southern and Northern blotting experiments. 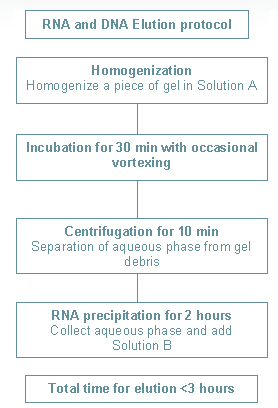 HealthGene Fast RNA and DNA Elution Kit™ provides high quality and easy-to-use reagents for nucleic acids elution from polyacrylamide gels in the shortest possible time. HealthGene Corporation is offering the fastest and easiest elution protocol which available on the market. STABLE – stable for more than two years at room temperature. he product is shipped by FedEx in 2 business days (delivery fees are applied). Fast RNA and DNA Elution Kit. Instruction Manual.